Have you ever wanted a coffee table that really stands out from the ordinary? Something that you wouldn’t find in the house next door? It’s easy to get something unique when you make the coffee table yourself. 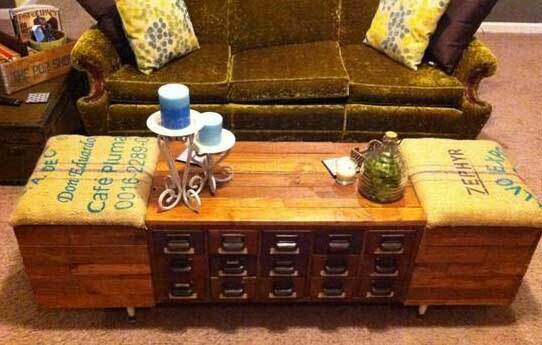 And, if you make that coffee table from an interesting vintage piece, it will definitely be a conversation starter. I came up with this roundup of unique coffee tables that are all made from vintage finds. Each one is full of the character that you may not find in a store. Let these coffee tables inspire you to use your own vintage piece for a unique style. What I like about this factory cart table is that the wood is all original. The factory cart was taken apart, refinished, and then put back together. 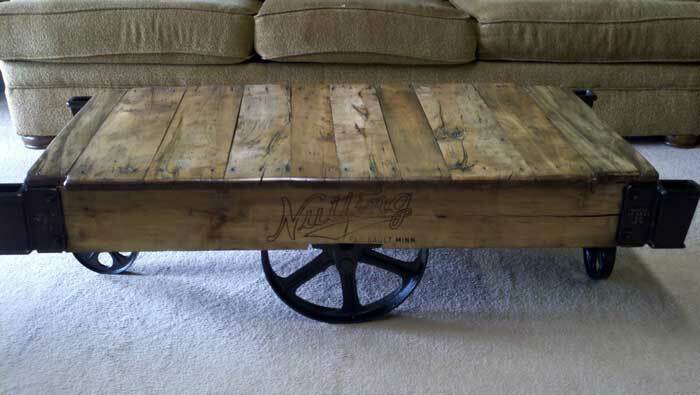 I have seen a lot of tutorials for factory cart coffee tables that use all new wood. This one is very authentic and unique with all of the original vintage cart being used. I have seen a luggage cart similar to this one at a high end restorations and antique store. I absolutely loved it but it was a bit pricey. If you can find a vintage factory cart and refinish it yourself, you can save a bundle! 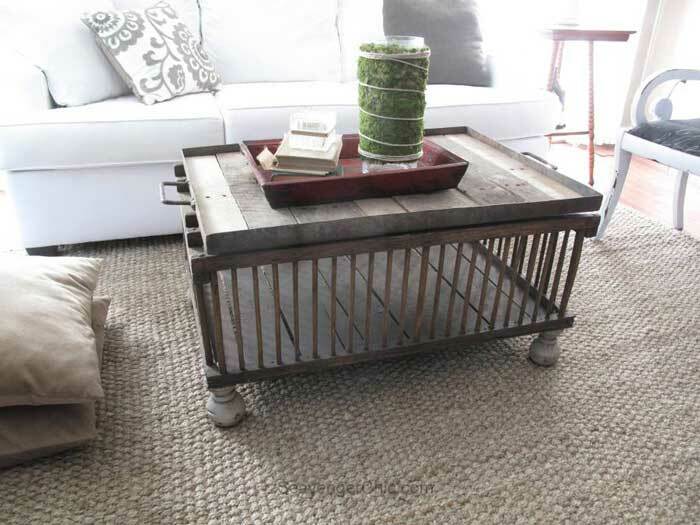 An old chicken crate gets a stylish new life as this shabby chic coffee table. I love the airiness of it which is especially nice for smaller spaces. I quite often see card catalogs in antique stores but I have never thought to use one as a coffee table. This design with the added storage ottomans on the sides looks amazing. Old doors are great to use in a variety of furniture DIYs. 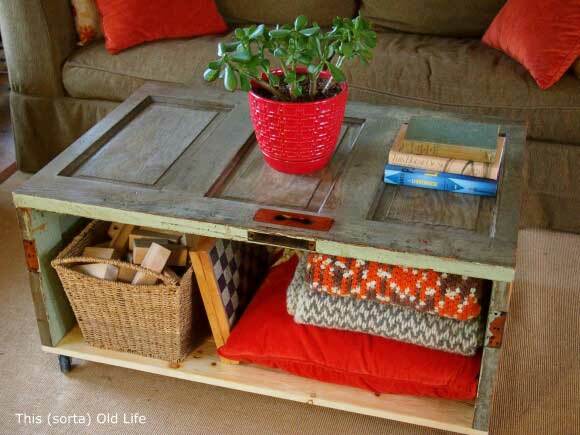 This coffee table is a perfect way to repurpose an old door. 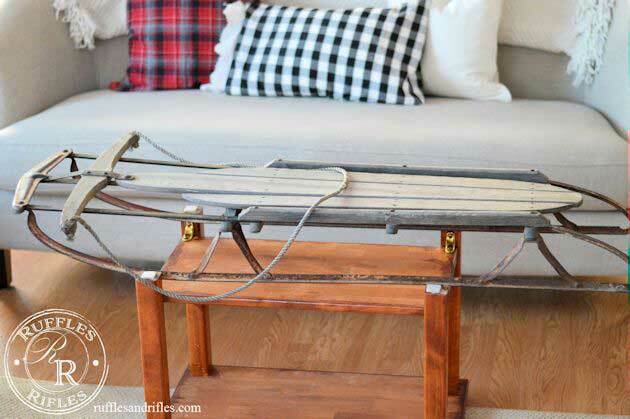 And finally, here is a vintage sled that is used as a fun winter coffee table. All you need is to make some kind of base to get an old sled high enough for a coffee table. Instead of building a base, the base for this coffee table is just an end table flipped upside down. I used an old ice sled to make a desk but it is another type of sled that would work perfectly for a coffee table.